In the 1950s, before pro football and major league baseball arrived in the Twin Cities, pro wrestling had a place on the sports pages of the local newspapers. The story below is from the Minneapolis Morning Tribune. There’s a lot to admire about old-time pro wrestling. As far as I know, grapplers did not use steroids or demand new arenas at public expense. But I can’t get the rules straight. It was legal to give your opponent a ferocious eye gouge, sleeper hold or pile driver. But rub a little salt in the eye? That was cheating. Vern[e] Gagne was declared the winner over Mitsu Arakawa on a reversed decision Tuesday night before 2,988 fans at the Auditorium. The time was 22:15 in the one-hour time limit match. 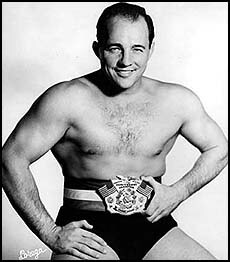 Verne Gagne in about 1953. The Japanese wrestler had felled the former University of Minnesota football star with his stomach claw hold, but referee Joe Valento reversed the call after Arakawa was said to have rubbed salt in Gagne’s eyes. Gagne pinned Arakawa initially with the drop kick but the referee was incapacitated at the time, having collided with the wrestlers. It was when the referee was out of action that Mitsu employed his salt trick. Several fans along with the boxing promoters jumped into the ring to call attention to the violation. In the semi-windup, Stan and Reggie Lisowski of Milwaukee defeated Tex McKenzie and Chet Wallich. Verne Gagne, 225, Excelsior, won by reversed decision over Mitsu Arakawa, 238, Japan, 22:15. Stan Lisowski, 254, Milwaukee, pinned Tex McKenzie, 275, Houston, 8:15; McKenzie pinned Stan, 10:40; Reggie Lisowski, 257, pinned Chet Wallich, 237, Hollywood, 6:10. Bearcat Wright, 270, Omaha, pinned El Toro, 300, 13:50. Joe Pazandak, 245, Medicine Lake, pinned Johnny Nellis, 212, Belgium, 12:20. 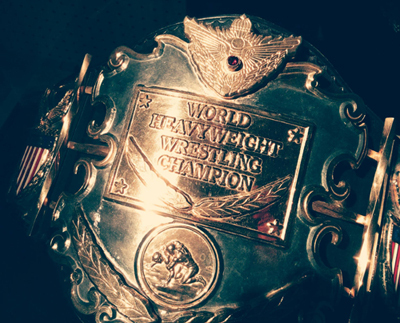 Verne Gagne's championship belt was on display at the Minnesota History Center in 2014.